Ben Carson Wasn't Qualified To Be In A Federal Agency In November, But Suddenly Now He Is? It was not long ago ago, on Nov. 15, that a spokesman for former pediatric neurosurgeon Ben Carson told reporters that Carson was not qualified to accept a position in President-elect Donald Trump's administration because Carson "has no government experience" and has "never run a federal agency." At the time, Carson was reportedly being considered for the secretary of Health and Human Services position, which, lack of governmental experience aside, at least seemed relevant to Carson's professional history. That's why reports that Trump had offered Carson a job as Secretary of Housing and Urban Development came as a surprise. Even more shocking was the news that Carson accepted the role of HUD Secretary. The same spokesperson who, eight days earlier, said Carson would not want to "take a position that could cripple the presidency," reportedly told the Wall Street Journal on Nov. 22 that Carson had accepted Trump's offer to lead the federal agency that handles the nation's housing needs and enforces its fair housing regulations. However, the nomination was still unofficial until Monday morning. Without spilling the beans, Carson took to Facebook in November to tease the forthcoming announcement. In doing so, he used some coded language that harkens back to Trump's campaign promises about turning around the nation's supposedly beleaguered "inner cities." Throughout his campaign, Trump often suggested that "inner cities" were populated almost exclusively by African-Americans, despite the reality that most African-Americans live in the suburbs or elsewhere, according to the latest Census data. During an October speech in Loveland, Colorado (an overwhelmingly white, semi-rural suburb between Denver and Fort Collins), Trump described the "inner cities" as "ghettos." Especially in the final months of his campaign, Trump often promised to work with African-Americans to improve the violent, crime and poverty-ridden communities Trump seems to believe all black people live in. Leaders in the African-American community roundly condemned Trump's characterization of predominantly black communities as not only inaccurate — as most African-Americans living in the United States today are not poor, CNN noted — but also offensive. Los Angeles Times writer Jessica Roy pointed out after the second presidential debate, many "inner cities" are populated by some of the wealthiest people in the country — including the central Manhattan area that serves as Trump's center of operations. Inaccuracy aside, Trump's campaign rhetoric equating inner-city poverty with black Americans makes it impossible not to notice that one of Trump's few African-American surrogates is now poised to lead the federal department that most directly addresses housing issues in economically depressed areas. As New York magazine noted, under previous Republican administrations, HUD has been a magnet for scandal and lax oversight that has led to criminal profiteering charges, since the department works closely with private real estate developers to build low-income housing. "Without careful oversight, the agency can easily become a slush fund to distribute sweetheart contracts to the administration’s buddies," wrote New York's Jonathan Chait. Chait then took his critique a step farther, noting that Carson, who has never held elected office, has "no experience or expertise" in the area of housing policy. When Cavuto asked Carson what he knows about federal housing policy, Carson leaned on his personal life experience. While everything about President-elect Trump's campaign and transition to the White House have been unconventional, Carson's appointment to lead a department that even he acknowledges knowing little to nothing about has raised more than a few eyebrows. 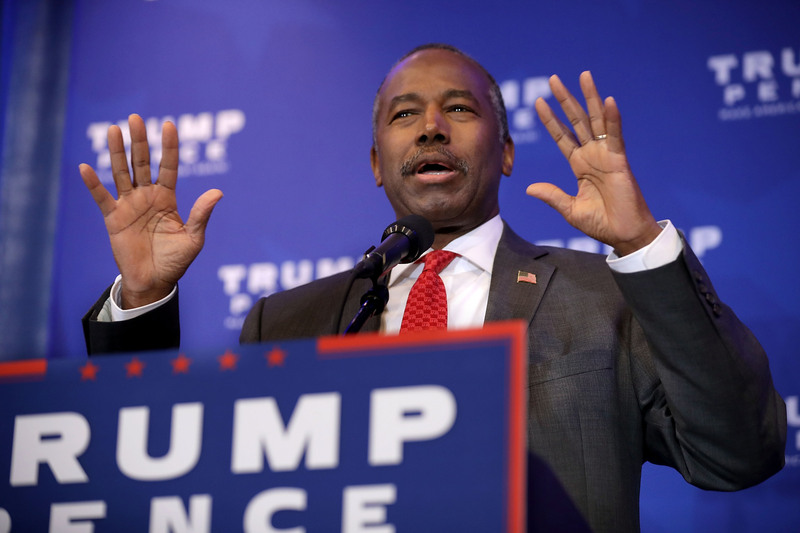 But much like Trump's earlier cabinet appointments, including Chief of Staff Reince Priebus, and senior adviser Steve Bannon, appointing Carson as HUD secretary falls squarely within Trump's longstanding practice of rewarding loyalists. And despite Trump's catchy campaign promises to "drain the swamp" of longtime Washington lobbyists and career politicians, it seems the incoming Trump administration will instead fill that swamp to the brim.